A helicopter crew prepares their Blackhawk helicopter for takeoff while family and friends watch. Company G, 3-126th General Support Aviation Battalion (MEDEVAC) will be deploying to Afghanistan later this spring for approximately one year. The Maine Army National Guard this spring will send to Afghanistan a unit that specializes in emergency medical evacuation of injured personnel. Company G, 3-126th General Support Aviation Battalion, a.k.a. MEDEVAC, will be deployed in the next two months, according to Maj. Gen. Douglas Farnham, Adjutant General for the Maine National Guard. 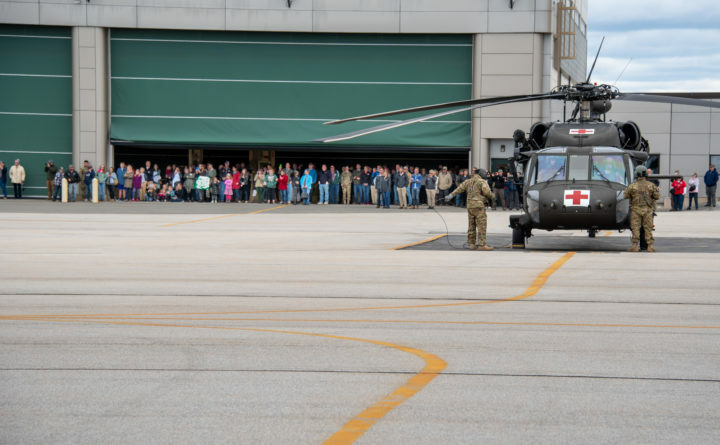 Approximately 150 soldiers from Maine, Washington D.C. and Idaho will provide emergency enroute patient care, and transport medical personnel and supplies in Afghanistan and Southwest Asia. They are expected to be deployed for one year. Officials from Maine’s military community, along with Gov. Paul LePage and members of the general public, held a ceremony on Thursday at Bangor High School to honor the soldiers. Company G has been deployed many times, including tours in Germany during the Desert Storm combat operation during the Gulf War, as well as in Guatemala, Bosnia, Kuwait and Iraq. It has provided assistance in Louisiana after Hurricane Katrina.